A significant portion of Niagara employers hire their staff through the ‘hidden’ job market, according to a newly-released youth employment policy brief co-researched by Brock University. 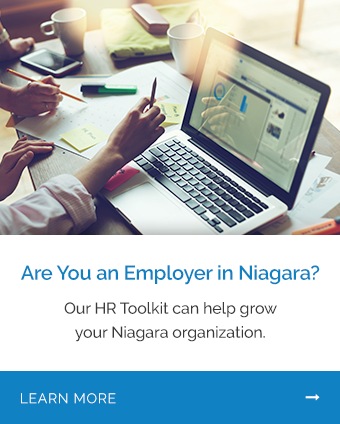 Brock’s Niagara Community Observatory (NCO) and the Niagara Workforce Planning Board (NWPB) estimate that 20 per cent of the region’s employers could be using private job boards, paywalls and other publicly inaccessible ways of recruiting employees rather than advertising positions openly. This makes it difficult for researchers and policy-makers to assess job demand in the region and come up with ways to address youth employment, according to the brief “Youth in Niagara: Highly Skilled, Highly Mobile,” released Tuesday, March 20 at Brock. Expanding on earlier research by the NCO, the Youth in Niagara brief expands population, education and occupation numbers to give a snapshot of the area’s youth employment situation and employment sectors most likely to hire youth. “If Niagara is going to be a region that remains globally competitive, and one that can energize growth in small-to-medium enterprise, then it is vital for us to engage in research topics that help us map and leverage our talent opportunities,” said NCO Director Charles Conteh. Mario De Divitiis, NWPB CEO, said the research is an important tool for the region. “This project demonstrates what happens when local research organizations collaborate on topics that serve the local needs while laying the groundwork for approaching systemic workforce challenges,” he said. The policy brief notes that there are no specific measures of capturing youth employment numbers outside of specific programs, as age-targeted hiring generally goes against labour and human rights legislation. The researchers therefore looked at entry-level jobs requiring less than two years’ experience.